On the heels of their six-time Academy Award-winning smash, 'La La Land', Oscar-winning director Damien Chazelle and star Ryan Gosling re-team for 'First Man', the riveting story of NASA’s mission to land a man on the moon, focusing on Neil Armstrong and the years 1961-1969. Click here to read our five-star theatrical review of ‘First Man’. The 'First Man' competition has now closed. Winners will be announced shortly. Competition opens at 5pm AEDT on Sunday 20th January 2019 and closes at 11:59pm AEDT on Sunday 27th January 2019. Five winners will be chosen at random on Monday 28th January 2019. To successfully win, entrants must fulfil the above entry conditions before the time the competition closes. Current members/followers are eligible to enter the competition. Only one entry per person. Only one winner per household. To be a valid winner, the entrant must not have won a prize from SWITCH within the last 28 days. Each winner will receive one Blu-ray copy of 'First Man'. By entering, you agree to receive occasional emails from SWITCH in the future. If you decide to unsubscribe from these updates, any further entries will not be applicable. Only Australian residents are eligible to enter. 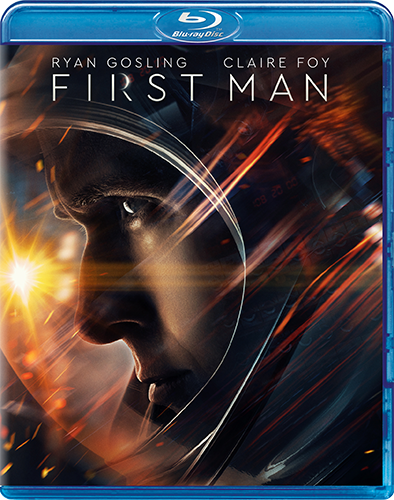 'First Man' is available on 4K Ultra HD, Blu-ray, Digital and DVD on Wednesday the 23rd January 2019 from Universal Sony.